Have an upcoming trip, but don’t know the rules on traveling with CBD? We’ll fill you in. CBD is a blessing for everything travel, and can help you battle nausea and motion sickness, reduce anxiety, and help with jet lag. CBD is continuing to rise in popularity due to its non-psychoactive nature (meaning it will not get you high) and plentiful list of therapeutic benefits. The cannabinoid has been proven its ability to fight inflammation, treat anxiety, decrease the proliferation of cancer cells, and lessen seizures. Numerous testimonials and scientific research suggest the natural cannabinoid’s healing potential. Now, the average consumer is wondering how they can benefit from the use of CBD. If you’re considering traveling internationally, you will have to check the laws on CBD pertaining to the country you plan on visiting. If they are CBD friendly, you are good to go. If they aren’t CBD friendly, or it is unclear, it is best to play it safe, as penalties can be high in certain regions. CBD oil (along with other CBD-infused products) is 100 percent legal in the US as long as it is derived from industrial hemp, and contains no more than 0.3 percent of THC. THC is known as a psychoactive cannabinoid, and is responsible for the “high” that people feel when they consume cannabis. However, It is important to remember that CBD does not have psychoactive effects and cannot get users high. Here is everything you need to know about traveling with CBD belongings. In the rest of this article we will discuss the various questions and concerns that come with traveling with CBD, and how it can help those that deal with constant travel. The TSA is a federal agency of the U.S. Department of Homeland Security that has authority over the security of public travel within the United States. Airports are included as the majority of TSA operations and are subject to the federal laws enforced by the TSA. Because marijuana is still federally prohibited, the TSA will most likely prevent you from traveling with cannabis flower or other products containing THC. CBD is the exception to this rule, especially if it is derived from hemp. CBD extracted from the hemp strain of the cannabis plant differs from CBD extracted from the marijuana strain of the cannabis plant. The main difference between these two is that CBD is non psychoactive, meaning that it can’t produce the “high” associated with THC and marijuana. The DEA (Drug Enforcement Administration) and the FDA (Food & Drug Administration) do not consider hemp-derived CBD to be the same as marijuana-derived CBD. This is a very grey area when it comes to CBD. More information on this important distinction can be found here. As long as the THC content in your CBD product is below 0.3 percent, you are in the clear. Make sure to check the label of your product to ensure it is within the legal limit. Every trusted CBD brand should give you a clear understanding of the contents within their products. If the product (oil, capsule, or other) says the CBD came from “industrial hemp,” or does not mention the actual levels of THC, it is very unlikely that you will have any issues with the TSA before your travels. If it is CBD oil you are carrying, however, make sure it stays within the confines of TSA requirements (no larger than 3.4 oz), just like your travel size shampoo or perfume. Follow these simple guidelines and you and your CBD should breeze through security without any issues. Research strongly suggests that CBD can help with symptoms of anxiety. In a survey of cannabis-related research, neuroscientist Carl Stevenson from the University of Nottingham, England, conveyed that CBD reduces fear by changing brain activity. So, instead of bellying up to the airport bar to down a vodka shot to calm your nerves, opt for the much healthier and much more effective way option of CBD. If you are aiming to travel with CBD, we recommend Orchid Softgels CBD Capsules by Orchid Essentials. These softgels utilize a specific VESIsorb delivery system technology, making them “body ready” for improved absorption and bioavailability. The technology used provides 5x the absorption of other capsules. The antioxidants and terpenes combine with CBD to bring optimal results for significantly reducing anxiety-related travel, as well as taming inflammation and stabilizing mood. CBD contains anti-nauseating properties, making it ideal for those with sensitive stomachs or digestive issues. The cannabinoid alone contains potent elements capable of reducing (or eliminating) the uncomfortable feelings associated with motion sickness. Individuals that experience nausea, upset stomachs, and vomiting. CBD interacts with the body’s Endocannabinoid System, or ECS, the crucial system responsible for keeping our bodies in a state of balance. When CBD is taken, signals are sent to the brain that tell receptors to stop feelings of nausea and motion sickness. When you enter a new time zone, your body needs time to adjust. Your heartbeat, blood pressure, and body temperature are all affected when you land into a new state or country. This can result in feelings of fatigue, body aches, headaches, and an all-around unpleasantness. You can minimize these post-travel effects by taking CBD. CBD does not have the negative side effects you see with taking other medications like melatonin, for sleep. CBD is a safe and effective way to treat common jet lag symptoms including anxiety, insomnia, muscle soreness, and headaches. Another product we recommend for frequent travelers is the RSHO-X THC-Free CBD Oil by Real Scientific Hemp Oil. This liquid is made with decarboxylated CBD, and has been entirely filtered of THC, making it next to impossible for a TSA agent to detect and/or confiscate. As long as the CBD is derived from hemp and contains less than 0.3 percent THC, it is legal to travel with within the US. Always check foreign policy and local laws on CBD when going international. Adhere to the 3.4 oz / 0.3 percent THC rule when choosing your CBD products, and you should have no problem with TSA or any other airport security. Research suggests that CBD can help travelers with anxiety, motion sickness, and jet lag. Daintri is an online CBD retailer committed to bringing you the highest quality CBD products on the market, all in one convenient place. 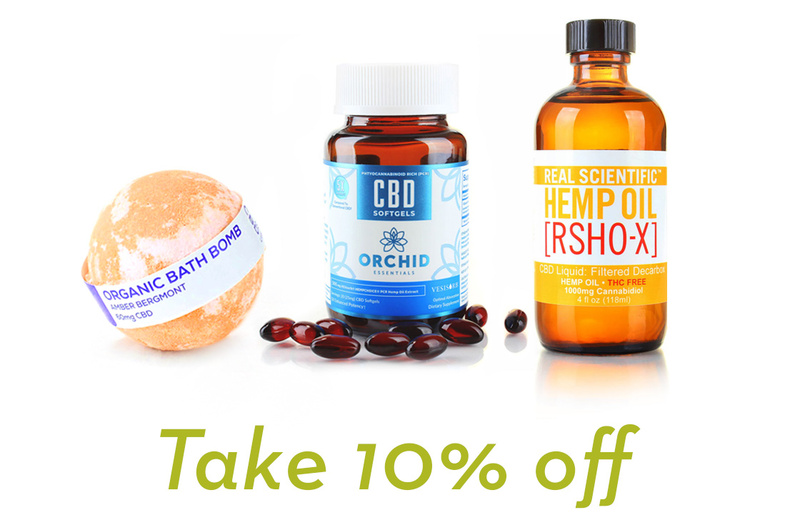 Some of our favorite CBD products that are easy to use while traveling include CBD oil, tincture, capsules, edibles, vapes, topicals, and more. We are home to multiple CBD brands, and because quality is our top priority, we care deeply about the ingredients and standards of our offerings. Previous post: Hemp vs Marijuana: What’s the Difference? Next post: The Entourage Effect: Is it Real?